Foreign Ministers of Russia (Sergey Lavrov), Azerbaijan (Elmar Mammadyarov) and Armenia (Edward Nalbandian) meet in Moscow. Photo Credit: Russian Foreign Ministry. The Foreign Ministers of Russia, Azerbaijan and Armenia, Sergey Lavrov, Elmar Mammadyarov and Edward Nalbandian, met Friday in Moscow on Russia’s initiative. 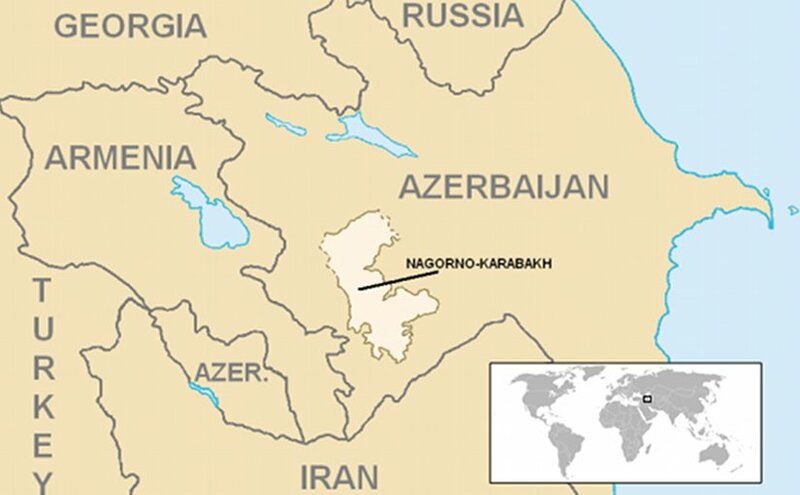 According to the Russian Foreign Ministry, the foreign ministers continued the discussion on the prospects for progress in the negotiation process on the Nagorno-Karabakh issue, emphasizing the need to implement the agreements reached at the Vienna and St Petersburg summits in April and June 2016. The Azerbaijani and Armenian Foreign Ministers expressed their gratitude to Russian Foreign Minister Sergey Lavrov for his efforts to promote a peaceful resolution of the Nagorno-Karabakh conflict. The ministers agreed to continue their contact on all the issues discussed, according to the Russian Foreign Ministry. Following their tripartite talks, the foreign ministers met with the co-chairs of the OSCE Minsk Group – the ambassadors of Russia, the United States and France, as well as the representative of the OSCE Chairman, where they exchanged views on the status of the Nagorno-Karabakh peace process.